Save yourself some stress with our Fuss-Free Ravioli Casserole Recipe. 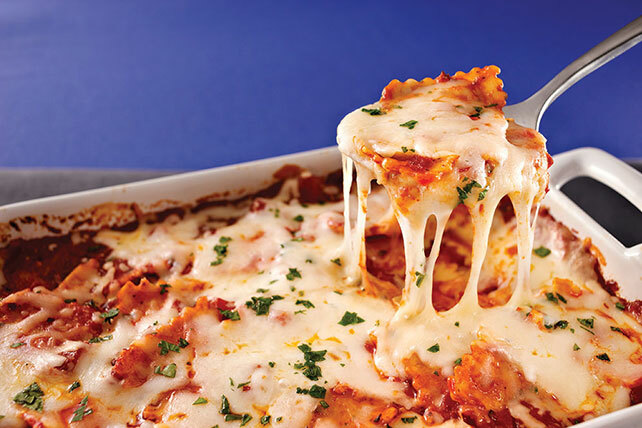 Our Fuss-Free Ravioli Casserole Recipe is the perfect mix of easy and cheesy. Combine first 4 ingredients in 13x9-inch baking dish sprayed with cooking spray. Add ravioli; stir to coat. Cover. Bake 50 min. or until ravioli is tender. Top with cheese; let stand 5 min. or until melted. Sprinkle with basil. You can also prepare this easy-to-make recipe using frozen ravioli - no need to thaw first. Serve with a side green salad tossed with your favorite KRAFT Lite Dressing.